Ukrainian intercontinental ballistic missile. The Yangel MR-UR-100 was designed as a replacement for Chelomei's UR-100 at the end of its 10 year storage life. Although it could be installed in the same silos, it was 50% heavier. The competing design of Chelomei, the UR-100N, was also put into production when the Soviet hierarchy deadlocked and could not pick one design over the other. AKA: 15A15;15P015;RS-16;Spanker;SS-17 Mod 1 and Mod 2. Status: Retired 1988. First Launch: 1971-12-10. Last Launch: 1987-05-23. Number: 78 . Payload: 2,550 kg (5,620 lb). Thrust: 1,147.00 kN (257,855 lbf). Gross mass: 71,100 kg (156,700 lb). Height: 23.90 m (78.40 ft). Diameter: 2.25 m (7.38 ft). Span: 2.25 m (7.38 ft). Apogee: 1,000 km (600 mi). The MR-UR-100 was Yangel's second attempt to get into production a competitor to Chelomei's UR-100 light ICBM. Design work began in 1964 after the R-36 had begun flight testing, thereby eliminating the leadership's grounds for prohibiting Yangel from working on the R-38. The concept was an ICBM to replace the UR-100 after it had exceeded its guaranteed storage life. 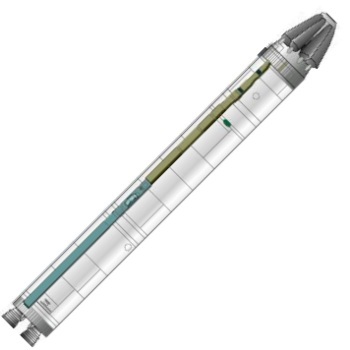 Yangel envisioned a missile that would fit into the 15P084 missile silos built for the UR-100, but be heavier through use of a missile of maximum possible diameter. In order to allow this and permit the possibility of rapid reload, a gas generator was used to 'cold launch' the missile clear of the silo before the first stage engine ignited. The resulting payload increase would allow the missile to carry multiple independently-targeted warheads (MIRV's). Chelomei also proposed the larger UR-100N as a replacement, but launched using the traditional and less-expensive hot-launch technique. The competition between the two chief designers led to a drama universally remarked upon in memoirs of Soviet rocketeers. Both design bureaus had powerful supporters in the Soviet leadership, and no consensus could be reached on which missile to put into production. The Yuzhnoye design was supported by Central Committee Secretary Ustinov, head of the VPK Military-Industrial Commission Smirnov, Mozhorin (Director of TNIIM), Tyulin (Deputy Commander MOM), and designers Glushko, and Pilyugin. Chelomei was supported by Marshal Grechko, Head of MOM Afanasyev, and designers Sergeyev, Barmin, Baryshev and V Kuznetsov. Keldysh headed an expert commission to select a design, but the split within the technical community resulted in a deadlock. Premier Brezhnev finally made the Solomonic but extremely expensive decision at a leadership meeting at Stalin's old dacha at Yalta -- both would be built and deployed. On 2 September 1969 a decree instructed KB Yuzhnoye to proceed with full development of the missile. The technical project was completed in 1969, with Utkin as the chief designer at Yuzhnoye. The draft project for Glushko's RD-268 booster engine was completed in 1970. This was to be an upgrade of the RD-263 building-block of the R-36M's first stage. First engine tests were begun in March 1971. In September 1970 MOM decreed that the missile must use a new 15P715P hardened silo design. This SM-SP-30 modification to the 15P084 silos was designed by TsKB-34 KBEM. It provided improved hardening against nearby nuclear detonations. The advanced project and a full-size mock-up for the modification had been completed in 1968. The design used shock absorbers and a container made of a special resin to allow the missile to survive in nearly every case unless the silo was in the crater of the enemy warhead explosion. The extra survivability came at a price -- conversion of a silo to use the MR-UR-100 cost three times more than converting it to use the UR-100N. Accordingly the MR-UR-100 would be deployed in only 1/7 the number of silos as its competitor. Ground tests of the missile began in May 1971 at the Pavlograd Mechanical Factory, and began at Baikonur on 15 September 1972. For flight tests KBTM designed the 8P867 common pad facility that could be used with either the MR-UR-100 or R-36M. This was built as LC-67 at Tyuratam in 1970-1971, with the missile preparation facility being built at Area 42. A series of 30 trials launches were conducted from these pads and prototype silos from 26 December 1972 to 17 December 1974. An official resolution was issued in October 1974 for the Yuzhnoye missile to go into production, although the work had already started a year earlier in anticipation of the decision. The missile was deployed in ten silos and one command point per regiment and the first regiment was already operational on 6 May 1975 at Vypolzovo. The missile was officially accepted for military service on 30 December 1975. Deployment increased to 50 silos by the end of 1977, 100 by the end of 1978, and the final total of 150 in 1979. The missile was deployed in two fields at Bologoye and Kostroma. Only those missiles deployed after 11 November 1976 at Bologoye were emplaced in the superhardened silos. A training facility for missile crews was established at Belabanovo. In 1979, during operational tests of missiles in-service, a problem was found with a high-frequency oscillation in the first stage motors. This severely degraded the missile's actual accuracy. Trials were made of modifications to fix the situation at the Perm Motor Machinery Factory between April and November 1977 under the direction of Ya M Sverdlov. The modification that solved the problem was officially accepted on 19 August 1980. It is not clear if the modification was made to field missiles, but the original model seems to have been replaced prematurely by its successor, the MR-UR-100UTTKh. Removal of MR-UR-100's from silos began in 1982 and all 150 were gone by the end of 1984. The post-boost re-entry vehicle bus was separated from the missile's second stage by a solid propellant motor. It could be used to deliver a single warhead or dispense four warheads against separate targets. It also deployed countermeasures (decoys, jammers) to confuse enemy defenses. The 71.1 metric ton missile was fuelled with 63.2 metric tons of N2O4/UDMH storable propellants and had a guaranteed life of ten years, fuelled and ready to launch in its container within the silo. Maximum range: 10,320 km (6,410 mi). Number Standard Warheads: 1. Warhead yield: 3,600 KT. CEP: 0.45 km (0.27 mi). Alternate warhead: 2,600 kg (5,700 lb). Maximum range with alternate warhead: 10,200 km (6,300 mi). Number Alternate Warheads: 4. Alternate warhead yield: 300 KT. Alternate warhead CEP: 0.45 km (0.27 mi). Boost Propulsion: Storable liquid rocket, N2O4/UDMH. Cruise Thrust: 142.627 kN (32,064 lbf). Cruise Thrust: 14,544 kgf. Cruise engine: RD-862. Initial Operational Capability: 1975. Total Number Built: 50. MR-UR-100U 15A16 Ukrainian intercontinental ballistic missile. Improved version of the MR-UR-100U loaded into the super-hardened 15P715U universal silo, with a modernized guidance system with better reliability and accuracy. Perimetr 15A11 Ukrainian strategic communications missile. Perimetr was developed for launch of a highly secret communications payload. This would be put in orbit or on a long high-altitude trajectory to provide back-up command and control of the strategic forces in the event of nuclear war. Family: ICBM. Country: Ukraine. Engines: RD-268, RD-862, RD-863. Launch Sites: Baikonur, Baikonur LC67/21, Baikonur LC173, Baikonur LC177, Baikonur LC170, Baikonur LC181. Stages: MR-UR-100-2, MR-UR-100 St 1, MR-UR-100-3. Agency: Yuzhnoye. Bibliography: 2, 475, 476, 8433. 1971 December 10 - . Launch Site: Baikonur. Launch Complex: Baikonur LC67/21. Launch Vehicle: MR-UR-100. FAILURE: Failure. BI-2 - . Nation: Russia. Agency: RVSN. Apogee: 0 km (0 mi). 1971 December 22 - . Launch Site: Baikonur. Launch Complex: Baikonur LC67/21. Launch Vehicle: MR-UR-100. BI-2 - . Nation: Kazakhstan. Agency: RVSN. Apogee: 1.00 km (0.60 mi). 1972 February 21 - . Launch Site: Baikonur. Launch Complex: Baikonur LC67/21. Launch Vehicle: MR-UR-100. BI-2 - . Nation: Russia. Agency: RVSN. Apogee: 1.00 km (0.60 mi). 1972 March 21 - . Launch Site: Baikonur. Launch Complex: Baikonur LC67/21. Launch Vehicle: MR-UR-100. 1972 May 6 - . Launch Site: Baikonur. Launch Complex: Baikonur LC67/21. Launch Vehicle: MR-UR-100. BI-3 - . Nation: Russia. Agency: RVSN. Apogee: 10 km (6 mi). 1972 May 24 - . Launch Site: Baikonur. Launch Complex: Baikonur LC67/21. Launch Vehicle: MR-UR-100. 1972 June 15 - . Launch Site: Baikonur. Launch Complex: Baikonur LC67/21. Launch Vehicle: MR-UR-100. 1972 September 15 - . Launch Site: Baikonur. Launch Complex: Baikonur LC173. Launch Vehicle: MR-UR-100. BI-4 - . Nation: Russia. Agency: RVSN. Apogee: 1,000 km (600 mi). 1972 November 3 - . Launch Site: Baikonur. Launch Complex: Baikonur LC173. Launch Vehicle: MR-UR-100. 1972 December 26 - . Launch Site: Baikonur. Launch Complex: Baikonur LC173. Launch Vehicle: MR-UR-100. 1973 March 12 - . Launch Site: Baikonur. Launch Complex: Baikonur LC173. Launch Vehicle: MR-UR-100. 1973 April 6 - . Launch Site: Baikonur. Launch Complex: Baikonur LC177. Launch Vehicle: MR-UR-100. 1973 June 5 - . Launch Site: Baikonur. Launch Complex: Baikonur LC173. Launch Vehicle: MR-UR-100. FAILURE: Failure. 1973 June 21 - . Launch Site: Baikonur. Launch Complex: Baikonur LC177. Launch Vehicle: MR-UR-100. 1973 July 9 - . Launch Site: Baikonur. Launch Complex: Baikonur LC173. Launch Vehicle: MR-UR-100. 1973 July 25 - . Launch Site: Baikonur. Launch Complex: Baikonur LC177. Launch Vehicle: MR-UR-100. 1973 October 2 - . Launch Site: Baikonur. Launch Complex: Baikonur LC173. Launch Vehicle: MR-UR-100. 1973 October 18 - . Launch Site: Baikonur. Launch Complex: Baikonur LC177. Launch Vehicle: MR-UR-100. 1973 November 4 - . Launch Site: Baikonur. Launch Complex: Baikonur LC173. Launch Vehicle: MR-UR-100. 1973 December 21 - . Launch Site: Baikonur. Launch Complex: Baikonur LC177. Launch Vehicle: MR-UR-100. 1973 December 27 - . Launch Site: Baikonur. Launch Complex: Baikonur LC173. Launch Vehicle: MR-UR-100. 1974 February 4 - . Launch Site: Baikonur. Launch Complex: Baikonur LC177. Launch Vehicle: MR-UR-100. 1974 February 26 - . Launch Site: Baikonur. Launch Complex: Baikonur LC173. Launch Vehicle: MR-UR-100. 1974 March 1 - . Launch Site: Baikonur. Launch Complex: Baikonur LC177. Launch Vehicle: MR-UR-100. 1974 April 3 - . Launch Site: Baikonur. Launch Complex: Baikonur LC177. Launch Vehicle: MR-UR-100. 1974 April 27 - . Launch Site: Baikonur. Launch Complex: Baikonur LC177. Launch Vehicle: MR-UR-100. 1974 April 28 - . Launch Site: Baikonur. Launch Complex: Baikonur LC173. Launch Vehicle: MR-UR-100. 1974 May 28 - . Launch Site: Baikonur. Launch Complex: Baikonur LC177. Launch Vehicle: MR-UR-100. 1974 May 31 - . Launch Site: Baikonur. Launch Complex: Baikonur LC173. Launch Vehicle: MR-UR-100. 1974 June 21 - . Launch Site: Baikonur. Launch Complex: Baikonur LC177. Launch Vehicle: MR-UR-100. 1974 August 28 - . Launch Site: Baikonur. Launch Complex: Baikonur LC173. Launch Vehicle: MR-UR-100. 1974 September 14 - . Launch Site: Baikonur. Launch Complex: Baikonur LC177. Launch Vehicle: MR-UR-100. 1974 September 27 - . Launch Site: Baikonur. Launch Complex: Baikonur LC173. Launch Vehicle: MR-UR-100. 1974 October 22 - . Launch Site: Baikonur. Launch Complex: Baikonur LC177. Launch Vehicle: MR-UR-100. 1974 October 23 - . Launch Site: Baikonur. Launch Complex: Baikonur LC173. Launch Vehicle: MR-UR-100. 1974 November 12 - . Launch Site: Baikonur. Launch Complex: Baikonur LC177. Launch Vehicle: MR-UR-100. Operational test launch - . Nation: Russia. Agency: RVSN. Apogee: 1,000 km (600 mi). 1974 December 17 - . Launch Site: Baikonur. Launch Complex: Baikonur LC177. Launch Vehicle: MR-UR-100. Mod 2 state trials missile test - . Nation: Russia. Agency: RVSN. Apogee: 1,000 km (600 mi). 1975 April 23 - . Launch Site: Baikonur. Launch Complex: Baikonur LC173. Launch Vehicle: MR-UR-100. 1975 June 13 - . Launch Site: Baikonur. Launch Complex: Baikonur LC173. Launch Vehicle: MR-UR-100. 1975 July 1 - . Launch Site: Baikonur. Launch Complex: Baikonur LC177. Launch Vehicle: MR-UR-100. 1975 August 12 - . Launch Site: Baikonur. Launch Complex: Baikonur LC173. Launch Vehicle: MR-UR-100. 1975 August 12 - . Launch Site: Baikonur. Launch Complex: Baikonur LC177. Launch Vehicle: MR-UR-100. 1976 March 12 - . Launch Site: Baikonur. Launch Complex: Baikonur LC173. Launch Vehicle: MR-UR-100. State trials flight - . Nation: Russia. Agency: RVSN. Apogee: 1,000 km (600 mi). 1976 May 17 - . Launch Site: Baikonur. Launch Complex: Baikonur LC177. Launch Vehicle: MR-UR-100. 1976 June 15 - . Launch Site: Baikonur. Launch Complex: Baikonur LC170. Launch Vehicle: MR-UR-100. 1976 June 26 - . Launch Site: Baikonur. Launch Complex: Baikonur LC173. Launch Vehicle: MR-UR-100. 1976 June 29 - . Launch Site: Baikonur. Launch Complex: Baikonur LC177. Launch Vehicle: MR-UR-100. 1976 August 12 - . Launch Site: Baikonur. Launch Complex: Baikonur LC173. Launch Vehicle: MR-UR-100. 1976 October 21 - . Launch Site: Baikonur. Launch Complex: Baikonur LC170. Launch Vehicle: MR-UR-100. FAILURE: Failure. 1976 October 26 - . Launch Site: Baikonur. Launch Complex: Baikonur LC177. Launch Vehicle: MR-UR-100. 1976 December 14 - . Launch Site: Baikonur. Launch Complex: Baikonur LC170. Launch Vehicle: MR-UR-100. 1976 December 16 - . Launch Site: Baikonur. Launch Complex: Baikonur LC173. Launch Vehicle: MR-UR-100. 1976 December 30 - . Launch Site: Baikonur. Launch Complex: Baikonur LC177. Launch Vehicle: MR-UR-100. FAILURE: Failure. 1977 March 26 - . Launch Site: Baikonur. Launch Complex: Baikonur LC173. Launch Vehicle: MR-UR-100. 1977 April 14 - . Launch Site: Baikonur. Launch Complex: Baikonur LC177. Launch Vehicle: MR-UR-100. 1977 May 25 - . Launch Site: Baikonur. Launch Complex: Baikonur LC173. Launch Vehicle: MR-UR-100. K? - . Nation: Russia. Agency: RVSN. Apogee: 1,000 km (600 mi). 1977 June 30 - . Launch Site: Baikonur. Launch Complex: Baikonur LC173. Launch Vehicle: MR-UR-100. 1977 July 30 - . Launch Site: Baikonur. Launch Complex: Baikonur LC177. Launch Vehicle: MR-UR-100. 1977 October 25 - . Launch Site: Baikonur. Launch Complex: Baikonur LC177. LV Family: MR-UR-100. Launch Vehicle: MR-UR-100U 15A16. 1977 December 29 - . Launch Site: Baikonur. Launch Complex: Baikonur LC177. LV Family: MR-UR-100. Launch Vehicle: MR-UR-100U 15A16. 1978 February 27 - . Launch Site: Baikonur. Launch Complex: Baikonur LC177. Launch Vehicle: MR-UR-100. 1978 March 26 - . Launch Site: Baikonur. Launch Complex: Baikonur LC173. Launch Vehicle: MR-UR-100. 1978 March 31 - . Launch Site: Baikonur. Launch Complex: Baikonur LC177. LV Family: MR-UR-100. Launch Vehicle: MR-UR-100U 15A16. 1978 April 27 - . Launch Site: Baikonur. Launch Complex: Baikonur LC170. LV Family: MR-UR-100. Launch Vehicle: MR-UR-100U 15A16. FAILURE: Failure. 1978 June 5 - . Launch Site: Baikonur. Launch Complex: Baikonur LC177. LV Family: MR-UR-100. Launch Vehicle: MR-UR-100U 15A16. 1978 June 5 - . Launch Site: Baikonur. Launch Complex: Baikonur LC173. Launch Vehicle: MR-UR-100. 1978 June 28 - . Launch Site: Baikonur. Launch Complex: Baikonur LC170. LV Family: MR-UR-100. Launch Vehicle: MR-UR-100U 15A16. 1978 July 22 - . Launch Site: Kostroma. Launch Vehicle: MR-UR-100. 1978 August 11 - . Launch Site: Baikonur. Launch Complex: Baikonur LC173. Launch Vehicle: MR-UR-100. 1978 August 23 - . Launch Site: Kostroma. Launch Vehicle: MR-UR-100. 1978 August 25 - . Launch Site: Baikonur. Launch Complex: Baikonur LC181. LV Family: MR-UR-100. Launch Vehicle: MR-UR-100U 15A16. 1978 September 12 - . Launch Site: Baikonur. Launch Complex: Baikonur LC177. LV Family: MR-UR-100. Launch Vehicle: MR-UR-100U 15A16. SLI Kura - . Nation: Kazakhstan. Agency: RVSN. Apogee: 1,000 km (600 mi). 1978 October 2 - . Launch Site: Baikonur. Launch Complex: Baikonur LC172. LV Family: MR-UR-100. Launch Vehicle: MR-UR-100U 15A16. 1978 November 27 - . Launch Site: Baikonur. Launch Complex: Baikonur LC181. LV Family: MR-UR-100. Launch Vehicle: MR-UR-100U 15A16. 1979 - . Launch Site: Baikonur. LV Family: MR-UR-100. Launch Vehicle: Perimetr 15A11. 1979 May 21 - . Launch Site: Baikonur. Launch Complex: Baikonur LC170. LV Family: MR-UR-100. Launch Vehicle: MR-UR-100U 15A16. 1979 May 31 - . Launch Site: Baikonur. LV Family: MR-UR-100. Launch Vehicle: MR-UR-100U 15A16. 1979 June 26 - . Launch Site: Baikonur. LV Family: MR-UR-100. Launch Vehicle: MR-UR-100U 15A16. SLI? - . Nation: Russia. Agency: RVSN. Apogee: 1,000 km (600 mi). 1979 June 29 - . Launch Site: Baikonur. Launch Complex: Baikonur LC170. LV Family: MR-UR-100. Launch Vehicle: MR-UR-100U 15A16. 1979 July 20 - . Launch Site: Baikonur. Launch Complex: Baikonur LC172. LV Family: MR-UR-100. Launch Vehicle: MR-UR-100U 15A16. 1979 August 2 - . Launch Site: Baikonur. Launch Complex: Baikonur LC170. LV Family: MR-UR-100. Launch Vehicle: MR-UR-100U 15A16. 1979 August 3 - . Launch Site: Baikonur. Launch Complex: Baikonur LC181. LV Family: MR-UR-100. Launch Vehicle: MR-UR-100U 15A16. 1979 August 30 - . Launch Site: Baikonur. Launch Complex: Baikonur LC170. LV Family: MR-UR-100. Launch Vehicle: MR-UR-100U 15A16. 1979 September 14 - . Launch Site: Baikonur. LV Family: MR-UR-100. Launch Vehicle: MR-UR-100U 15A16. 1979 November 15 - . Launch Site: Baikonur. LV Family: MR-UR-100. Launch Vehicle: MR-UR-100U 15A16. 1979 December 26 - . Launch Site: Baikonur. Launch Complex: Baikonur LC181. Launch Vehicle: MR-UR-100. 1980 - . Launch Site: Baikonur. Launch Vehicle: MR-UR-100. 1980 March 6 - . Launch Site: Baikonur. Launch Complex: Baikonur LC172. LV Family: MR-UR-100. Launch Vehicle: MR-UR-100U 15A16. 1980 April 18 - . Launch Site: Baikonur. Launch Complex: Baikonur LC172. LV Family: MR-UR-100. Launch Vehicle: MR-UR-100U 15A16. OT K - . Nation: Kazakhstan. Agency: RVSN. Apogee: 1,000 km (600 mi). 1981 - . Launch Site: Baikonur. LV Family: MR-UR-100. Launch Vehicle: Perimetr 15A11. 1981 April 18 - . Launch Site: Baikonur. Launch Complex: Baikonur LC172. LV Family: MR-UR-100. Launch Vehicle: MR-UR-100U 15A16. 1981 June 16 - . Launch Site: Kostroma. Launch Vehicle: MR-UR-100. 1981 July 9 - . Launch Site: Kostroma. Launch Vehicle: MR-UR-100. 1981 July 15 - . Launch Site: Kostroma. Launch Vehicle: MR-UR-100. 1981 July 23 - . Launch Site: Kostroma. Launch Vehicle: MR-UR-100. 1981 September 14 - . Launch Site: Kostroma. Launch Vehicle: MR-UR-100. 1981 September 18 - . Launch Site: Kostroma. Launch Vehicle: MR-UR-100. 1982 - . Launch Site: Baikonur. LV Family: MR-UR-100. Launch Vehicle: Perimetr 15A11. 1982 January 28 - . Launch Site: Baikonur. LV Family: MR-UR-100. Launch Vehicle: Perimetr 15A11. FAILURE: Failure. 1982 February 16 - . Launch Site: Kostroma. LV Family: MR-UR-100. Launch Vehicle: MR-UR-100U 15A16. 1982 February 20 - . Launch Site: Kostroma. Launch Vehicle: MR-UR-100. 1982 March 22 - . Launch Site: Kostroma. Launch Vehicle: MR-UR-100. 1982 March 23 - . Launch Site: Kostroma. Launch Vehicle: MR-UR-100. 1983 - . Launch Site: Baikonur. LV Family: MR-UR-100. Launch Vehicle: Perimetr 15A11. 1983 October 4 - . Launch Site: Kostroma. LV Family: MR-UR-100. Launch Vehicle: MR-UR-100U 15A16. 1984 - . Launch Site: Baikonur. LV Family: MR-UR-100. Launch Vehicle: Perimetr 15A11. 1984 - . Launch Site: Baikonur. Launch Vehicle: MR-UR-100. 1984 November 13 - . Launch Site: Baikonur. LV Family: MR-UR-100. Launch Vehicle: Perimetr 15A11. 1987 May 20 - . Launch Site: Kostroma. Launch Vehicle: MR-UR-100. 1987 May 23 - . Launch Site: Kostroma. Launch Vehicle: MR-UR-100. 1988 - . Launch Site: Baikonur. LV Family: MR-UR-100. 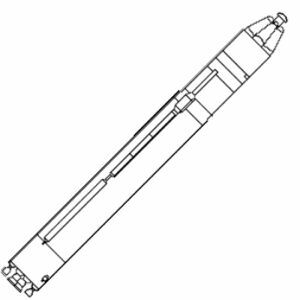 Launch Vehicle: Perimetr 15A11.